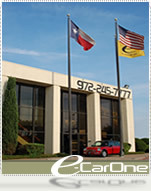 E-CarOne is based in Carrollton, Texas in the heart of the D/FW Metroplex, with the Historical Fort Worth Stock Yards to our west and the legendary Dallas Cowboys to our south. We are approaching our 15th year in the business of providing the Metroplex with the highest level of customer service and satisfaction. Since 2001, our dedicated staff has been providing the same great service to our national and international customers through our online storefront. 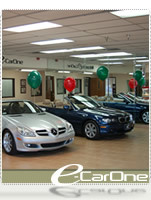 E-CarOne, deals almost exclusively in Lease Vehicles. These are lease returns, bank repossessions, corporate fleet cars and distressed Liquidation units from various bank & financial institutions. These vehicles are usually one owner. The biggest advantage is the price! Our customers have enjoyed huge discounts as much as 35% below book value. Over the years, we've sold thousands of pre-owned vehicles in all makes and models. We can say with enthusiasm that our quality pre-owned vehicles have given excellent service to their new owners as well as the best value for their money. With over 40 years combined experience in automobile sales and re-marketing, getting you in your new car, truck, or SUV is now easier than ever. If you’re looking for peace of mind, our knowledgeable Extended Warranties and Service Agreements department can help secure and protect your investment. Our new site is focused on being easy to navigate, clear & simple to view, with new features: Our live inventory page & shipping quote page. We hope you find it interactive and its informational features rich in content. Experience a virtual 360 degree interactive tour of our showroom. See More customer Success Stories & Feedback. To arrange a visit to Dallas, Click here for helpful tips and info. To arrange a visit to Fort Worth, Click here for helpful tips and info. To arrange a guest drive please contact us by E-mail or by phone.